An Energy Weapon, and a specific subtype of Ki Attack or Functional Magic that takes the form of one or more glowing orbs of Pure Energy/Pure Magic. Most commonly made of light, electricity or fire. Warning: just because it's shaped like a ball doesn't always mean it will bounce off flat surfaces. In fact, they're far more likely to explode on impact. You may need special equipment if you want to play tennis. Often created by Sucking-In Lines. This is an integral part of a Shotoclone. Yu Yu Hakusho: Sensui's Reikou-resshuu-ken (single) and Resshuu-shien-dan (multiple) attacks. Dragonball Z: Vegeta's Big Bang Attack, and Broly's signature attack. Not to mention the Spirit Bomb, And going back much further, Yamcha's Spirit Ball. Generic balls of energy also get thrown around in pretty much every fight as well. Keroro Gunsou: Parodied with Tamama's Jealousy Ball. Vivio's Sankt Kaiser form in Magical Girl Lyrical Nanoha has the Impact Cannon, a huge energy ball that she punches out of her fist, and the Sacred Cluster, energy balls she throws which would explode around a target and bombard them with smaller energy bullets. Ku:Nel Sanders of Mahou Sensei Negima uses giant orbs of gravity magic during his fight with Kaede. Kaede hit back with massive balls of ki. Naruto's Rasengan. Unique in that it normally can't be thrown. Some of the Fire Style jutsu favored by, among others, the Uchihas, fall into this category, as does the only special attack used by Naruto's four-tailed release. Iconic Magic: The Gathering creature Ball Lightning is a ball-shaped lightning elemental. It only lasts one turn, with the intent that you'll throw it at your opponent immediately to inflict a good bit of damage. Time Bandits. The mini-fireballs that shoot out of the eyes of the cow-skull-head monsters. On YouTube starting at 5:10. 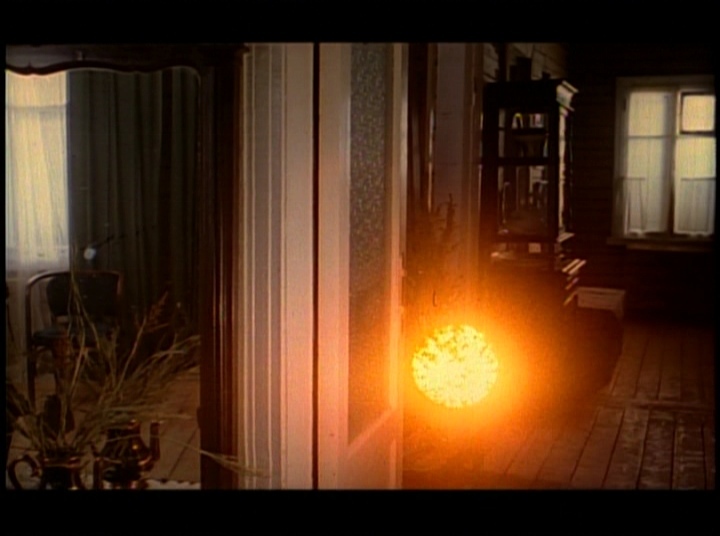 In Burnt by the Sun, the ball lightning is a recurring Motif. During the climactic duel between Luke Skywalker and Darth Vader in the Alan Dean Foster's Star Wars Expanded Universe novel Splinter of the Minds Eye, Vader creates a kinetite, a ball of pure white energy the size of his fist, and sends it at Luke. Luke hits it back at Vader, and Vader's armor is dented inward as if hit by a giant's fist. Mighty Morphin Power Rangers: The Mega Dragonzord's finisher is a giant blue energy sphere with a Z in the middle that completely disintegrates the monsters it's used on. Dungeons & Dragons: numerous, including the ever-popular Fireball spell. And Magic Missile, although that may be dart-shaped. interestingly enough, Magic Missle can be assigned any visual representation the caster wishes, even as its being cast (at least for spontaneous casters) though it defaults to this trope. Being killed by mini casters glomping you to death has never been so much fun. Though perhaps the best examples are the various "Orb of X" spells, most of which have a "Lesser" version too. The Wichita Witches' trademark spell, Ball o'Doom. 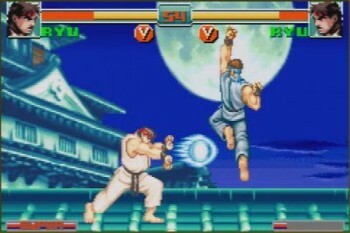 The Hadoken move in Street Fighter, of course. And every other projectile attack that isn't physical. In addition to the actual "Energy Ball" attack, there's also Zap Cannon (Electric-type), Shadow Ball (Ghost-type), and Aura Sphere (Fighting-type). Flash Cannon, which is a Steel-type attack, also looks like a round ball of energy, even if it's not explicitly in the name. Generation V brings us Searing Shot (Ball of Flame/Flame Bomb in Japanese), an attack that can only be learned by one Pokémon, Victini, who happens to be a Fire/Psychic-type. Mega Man shoots off spherical energy pellets of varying size throughout the series. Biotic charges in Mass Effect 2 appear as basketball-sized semi-spherical missiles of blue and white energy, with slight variations depending on which power you use. In Devil May Cry, Dante can launch fire or light balls at points, while in the first game during his Eleventh-Hour Superpower, he launched demonically powered energy balls. Portal uses similar energy balls to Half-Life 2 in many puzzles. Portal and HL2 are set in the same universe, and use the same graphic effect and sounds for the balls, but they are referred to as "High Energy Pellets" in Portal. Unlike HL2, if they hit you they will vaporize you instantly. Halo has several. One of them is the plasma pistol, which has semiautomatic firing of these, or you can charge it up and release a big one at the expense of energy and overheating. Plasma rifle has fully automatic firing energy balls. In Dissidia Final Fantasy, Kuja has several of these floating around him during battle, and uses them for several of his attacks. Elizabeth Greene's One-Winged Angel form in Prototype can fire what are presumably energy balls. Somewhat off considering the mostly organic nature of the series. This is the ranged attack that bareknuckles have in Soul Nomad and The World Eaters. Enough attacks in Touhou (a lot of bullets are round), but especially Utsuho Reiuji's attacks (read: nukes) and Reimu's Fantasy Orb and Fantasy Seal. In Order of the Stick, Tsukiko the Mystic Theurge learns a number of non-core "orb" spells (Electric Orb, Fire Orb, Lesser Acid Orb, Cold Orb) in order to counter Haley's evasion skill. Aelita from Code Lyoko, since the start of Season 3, gains pink energy balls, called Energy Field, as an attack in Lyoko form. When it hits one of XANA's goons, this covers entirely the monster in energy that destroy it, with no need to Attack Its Weak Point. This page was last edited on 23 September 2018, at 19:51.